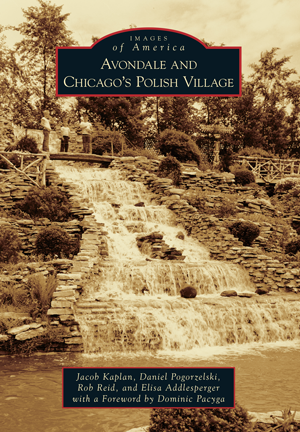 Home to Chicago's Polish Village, impressive examples of sacred and industrial architecture, and the legendary Olson Waterfall, Avondale is often tagged as "the neighborhood that built Chicago." Images of America: Avondale and Chicago's Polish Village sheds light on the little known history of the community, including its fascinating industrial past. From its beginnings as a sleepy subdivision started by a Michigan senator, it became a cultural mecca for Chicago's Polish community, playing a crucial role in Poland's struggles for independence. Other people also called Avondale home, such as Scottish proprietors, African American freedmen, Irish activists, Swedish shopkeepers, German tradesmen, Jewish merchants, Filipino laborers, and Italian entrepreneurs; a diversity further enriched as many from the former Soviet Bloc and Latin America settled here. As in other Chicago neighborhoods, change is the one constant, as the arts have brought a renaissance to this working-class corner of the city. Jacob Kaplan is editor and cofounder of Forgotten Chicago. Daniel Pogorzelski is the vice president of the Northwest Chicago Historical Society and coauthor of the titles Portage Park and Bridgeport in the Images of America series. Rob Reid is a current Avondale resident and the founder of Avondale Time Machine, a local history blog. Elisa Addlesperger first discovered the joys of Chicago neighborhood history while working at the DePaul University Library Special Collections and Archives.